In March 1999, I took a team of archaeologists, architects, restorers, conservators and engineers and started the largest expedition ever in Egypt. We established a large camp in the area which is located about 6 km from the town of El Bawiti, the capital of Bahriya Oasis. We conducted a survey and found that the cemetery was about 6 km square. 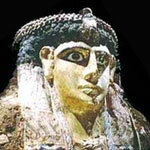 We started the excavation in four tombs only and found 105 mummies inside them. 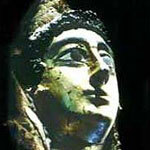 The mummies are in good condition showing the richness of the people in that time. · The last style are mummies wrapped in linen. Lots of artifacts were found near the mummies, such as statues of mourning ladies made of pottery. Other artifacts, such as different types of pottery in the shapes of the God Bes, the dwarf god of pleasure and fun. Other artifacts including bracelets, earrings and coins were found. The study of these coins reveal that this find dates from the Greek to the Roman Period. The Tombs consist of an entrance, delivery room and two burial chambers. One of the mummies is a guilded lady with her head turned toward the face of her husband with love and affection. Others are buried as a family group, with their children. The mummies of the children were covered with gold. Another woman has a crown with four decorative rows of red-coloured curls. The third and fourth rows are missing significant pieces. Beneath the crown the hairstyle is similar to that of Terracotta statues. Behind the ears appears the goddess Isis on one side and Nephthys on the other - these protect the deceased with their wings. The decorative scenes show an abbreviated form of the judgement of the dead. In these scenes we see the god Osiris on his throne while Anubis weighs the heart of the dead against the feather of Maat. Meanwhile, Toth records the result of the weighing process and reports it to Osiris. Anubis, who is portrayed on the mummies, played an important role in several ways. First is his well attested role in the judgement scenes - it is he who operates the scale on which the heart is weighed against the feather. Second is his performance of the embalming - a basic condition for rebirth. Anubis protects the body of the deceased and assists in its revival. Therefore, we find Anubis in the representations on coffins and mummy masks performing mummification rites. 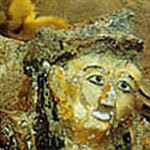 The Uraeus appears on the head of some of the mummies belonging to non-royal persons. This probably indicates the desire of the deceased to have a transfiguration similar to that of a king. In the Roman Period, different elements appear - such as crowns and the use of a king's or god's beard of Uraeus, taken from the royal cult and used by the public. We expect to find at least 10,000 mummies in this cemetery. We preserved mostly all the mummies in situ, but we did move only a few to a room in the Bahariya inspectorate to show them to the public.